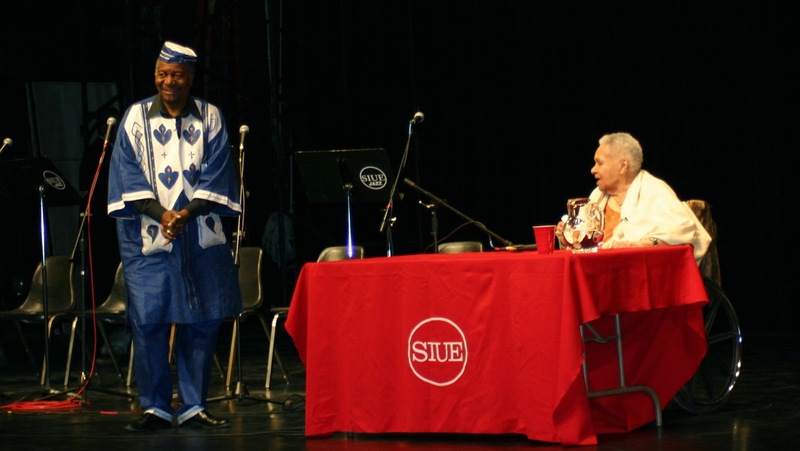 Few English departments and even universities in the country can boast to have hosted a large number of prominent African American cultural figures in just a few years. Hosting prominent figures is especially unlikely, it must be said, when and if the sponsoring department and institution have little funds. Nonetheless, between 2003 - 2012, we managed to have an extraordinary line-up of visitors on campus: Maya Angelou, Amiri Baraka, Nikki Giovanni, Sonia Sanchez, Quincy Troupe, Mari Evans, Joy Harjo, Haki Madhubuti, the late Jayne Cortez, and the late Katherine Dunham. Different events led to those visits, but one common thread running through those multiple esteemed guests coming to campus was the presence of what we might call "the Redmond Effect," the involvement of Eugene B. Redmond in humanities activities taking place at SIUE. Maybe Redmond already had his sights on a 2007 retirement when I arrived in the fall of 2003, because in short order, he was organizing an all-star cast of poets, artists, and cultural workers. In the fall of 2003, he hosted Quincy Troupe. Sanchez and Harjo were here at different times a year later. In 2005, Baraka, Cortez, Madhubuti, and Dunham visited. In 2006, it was Mari Evans. Although Redmond retired in 2007, he was actively involved in visits to campus by Angelou in 2008 and Giovanni in 2012. Believe it or not, those visits did not take place during the month of February. And those were the nationally known figures. Between 2003 and 2007 alone, I witnessed Redmond hosting events that featured more than 100 local writers, musicians, visual artists, and dancers. During that time, we coordinated several exhibits based on Redmond's photographs, which led to the development of the Underground Reading Room. Among other results, the Redmond Effect has been a defining force in the development of African American literature at SIUE during the last ten years.